Have you written a book about parenting? Do you now need a literary agent to help you find a highly regarded publisher for your book? The following 19 top literary agents for parenting books are accepting submissions. Hailing from Andover, Massachusetts; Stephanie Rostan can be your best bet for representing parenting books. Yes. Whether it’s a how-to guide, an anthology, a memoir or practically anything related to parenting- she’ll be more than just happy to represent your work. That being said, Stephanie is extremely strict about quality, so only send in your work if it’s compelling enough to make the cut. With a B.A Degree from Princeton University, Stephanie has been a literary agent for the last two decades. She started her career as an editor at Bantam Dell, before eventually taking the position of a book editor at iVillage.com. However, the most defining moment in her career was when she co-founded the Levine Greenberg Rostan Literary Agency. Here, she served as a literary agent for thirteen years before finally becoming a Principal Literary Agent. ‘Welcome To Your Child’s Brain’, ‘Queen Bees Wannabes’ are two among the very many parenting books that she has represented. So if you have a similar (or even better) manuscript to share, contact her on this page. With a publishing career of more than two decades, Wendy Sherman is yet another top pick for your parenting manuscripts. Since Wendy has held senior positions at agencies like Simon & Schuster and Henry Holt, you can always count on her for proper and consistent distribution. She later went on to establish Wendy Sherman Associates, Inc, where she represented best-selling authors like, Denna D Babul and Karin Luise. As of now, Wendy also holds a Board Of Directors position in the Association of Authors Representative Group. In case you’re planning to pitch your parenting manuscript, do note that she is fond of works with a strong narrative voice that involves relevant practical insights. So, if you think your parenting manuscript is close enough to make the cut, get in touch with her here. If you’re looking to work with a veteran who is well aware of the nitty gritty of the publishing industry- Lisa Leshne can be an excellent option. Lisa first joined the industry in 1991 by co-founding ‘The Prague Post’ which eventually turned out to be the biggest English Language Daily in Central Europe. Eight years later she shifted to Manhattan to join the media division of Accenture. From there she managed to bag prestigious roles in Dow Jones and Wall Street Journal. After working with leading names throughout a significant part of her career, Lisa wanted to try something new. And that is exactly how her Lisa Leshne Agency came to be. Here she has represented best-selling titles like ‘ABCs of Parenthood’, ‘No regrets Parenting’ and ‘Hell is other parents’. Luckily enough she is currently accepting submissions. So if you have your best parenting manuscripts to share, contact her on this page. Founder of the Knight Literary Agency, Diedre Knight has an illustrious career in the publishing and entertainment industry. Her career spans back to more than three decades when she collaborated with Penguin, Macmillan and other leading publishing houses. Knight’s independent venture stemmed from her desire to create a platform for newbie authors and although she wasn’t confident in the beginning, her agency bagged big contracts from both new and established authors. As of now, she has represented more than 800 titles (most of which are fiction). While she is currently seeking romance titles, her interests aren’t limited here! Yes. This means you can also send in your non-fiction parenting title if you’re confident about its impending success. Diedre can be reached on this page. Rita Rosencrantz started her career as an editor in Macmillan. Over the time, she managed to bag many prestigious gigs in leading publishing houses. But Rita wanted to try something even more unconventional; she wanted to be in charge, and that is exactly why she came up with the Rita Rosencrantz Literary Agency. Here she has represented several award-winning authors for their non-fiction titles. Since parenting is one among the many different genres she represents, you can always contact her with your new titles. You can submit your book proposal to Rita on this page. Having spent a significant chunk of his career in working with new ideas and identifying true literary merit, Jim Levine is definitely one of the best literary agents to be featured on our list. After graduating from Phi Beta Kappa and qualifying with two advanced degrees from UC Berkeley, he joined Wellesley College where he spent almost a decade. Right after that, he held the position of Vice President at the Bank Street College. Here he received a first-hand experience of working closely with new authors. Over the time, Jim switched paths and decided to co-establish the Levine Greenberg Rostan literary agency. During his time in the agency, he has represented a broad range of genres including parenting, psychology, socio-political issues and many more. So if you’ve written a parenting title, contact Jim on this page. Kari Sutherland is one of the best literary agents who’ll represent any gripping title under parenting. After starting her career as a Senior Editor of HarperCollins, Sutherland decided to work for Bradford Literary Agency. And interestingly enough, within just one year she managed to represent New York Times Best Selling authors like Sara Shepard and Victoria Aveyard. Kari is actively seeking parenting titles that are compelling enough to change a parents towards themselves. So if you’ve written a similar book, contact Kari right away on this page. With over three decades of industry experience, Meredith Bernstein is yet another veteran to be featured on our list. Meredith started her career as a story editor for East and West Coast producers. Alternatively, she also worked as a freelance reader in her spare time. Almost ten years back she came up with the idea of opening her very own literary agency, and that is how Meredith Bernstein Literary Agency came to inception. Meredith loves working with new parents who have some good contents to share. So if you think you fit the bill, contact her here. P.S- Meredith will only accept your hard copy submissions. After completing her Ph.D in history from Berkeley, Suzy decided to join the publishing industry. While she did hold some prestigious positions in Harper Collins and Macmillan, her biggest break as a literary agent was in Sandra Dijkstra Literary Agency. Here, she has represented quite a few nonfiction titles covering history, food, health, lifestyle and most importantly, parenting. Having worked with leading authors like Andrea Hutton and Lily Faderman, Suzy has developed a particular fondness for insightful titles with a strong narrative voice. As of now, she is seeking parenting titles that are smart, relevant and truly useful. So if you think your work can fit her needs, send in a copy of your manuscript here. Currently working as a literary agent in Stonesong , Judy had her fair share of experience in the publishing industry. Over the last two decades, she has worked in Macmillan, Penguin and many other leading publishing houses. At Stonesong Literary Agency she is currently looking for fresh narrative voices that beautifully communicate the problems and possibilities of parenting. ‘A Mother Is a Story’, ‘Kids are turds’ and ‘My Prudent advice’ are a couple of best-selling works represented by Judy. So if you think you’ve written titles in a similar tone, get in touch with Judy on this page. After a short stint as an editor of a small publishing house, Carol Mann decided to come up with her own literary agency in 1977. Since then, she has represented non-fiction authors from diverse genres like health, medicine, coffee-table books and parenting. Mann loves reading parenting titles that are compelling and insightful at the same time. Some of the recent books represented by her include ‘What Great Parents Do’ and ‘From Mom to Me Again’. In case you’re willing to collaborate with Carol, reach her on this page. With an industry experience of more than three decades, Linda Konner is definitely the right person for your upcoming book on parenting. Throughout her career, Linda has served as an editor, an author and columnist for leading magazines like Cosmopolitan, TV Guide and The New York Times. Although she doesn’t exclusively work with parenting manuscripts, she has represented quite a few best-selling parenting titles like ‘Zen Teen’ and ‘The Book Of You’. Luckily enough, she is currently accepting parenting manuscripts. So if you have your best work to share, contact her on this page. Yet another agent from the Knight Literary Agency, Pamela Harty is one of the best professionals for your upcoming parenting book. Having worked as an intern for short-time projects in HarperCollins and Macmillan, Harty decided to join The Knight Literary Agency in 200. Since then she has represented hundreds of authors for parenting, self-help and coffee table books. As of now, she holds the position of Vice President in the agency. Likewise, she’s also a part of the Association Of Author’s Representatives branch of America. Pamela is currently accepting parenting titles and you can contact her here. If you’re looking to collaborate with an agent who has worked with esteemed publishing houses like Boxtree, Penguin and Ebury- Clare Hulton can be your best bet. Clare holds Bachelor’s Degree from Durham University, and going by her educational qualifications and experience- she definitely seems like a good fit. Like many other agents on our list, Clare too decided to come up with her own venture, Clare Hulton literary agencies. Here, she has worked with very many non-fiction genres including parenting. So if you think your parenting manuscript is good enough to impress Clare, send in a copy of your manuscript here. After working as an editor and book producer for a couple of trade publishing houses, Gareth Esersky decided to join the Carol Mann Agency in 1993. Here, she represents a wide range of non-fiction titles. So whether its health, self-help, psychology or parenting; Gareth will help you with all of it. Having said that, do note that Gareth is extremely particular about quality. So send in your title only if it’s well-researched and compelling enough to grab her attention. ‘Why Kids Lie’ and ‘Disconnected Kids’ are two among the several books represented by Gareth. In case you’re up and willing for submitting a copy of your manuscript, contact her on this page. After qualifying with a bachelor’s degree from Sarah Lawrence College, Katherine was pretty sure that she wanted to be a literary agent. So right after her graduation, she joined Sarah Jane Freymann Literary Agency where she currently holds the position of a Senior Literary Agent. With more than two decades of experience, she is extremely keen on helping newcomers start out. As of now, she works with self-help, parenting and lifestyle titles. And guess what? Best-selling books like ‘The Good Enough Teen’ and ‘Things Just haven’t been the same’ are some of the works she has represented. So if you’ve written something in a similar vein, send in your manuscripts here. Tamela Hancock had always wanted to be a writer. She started writing from a very young age by contributing to her school magazines and newspapers. But when Tamela completed her graduation from Lynchburg College of Virginia, she decided to explore newer options and that is exactly how she came to co-establish the Tamela Hancock Murray Agency. After her short stint in Hartline Agency, she is now thrilled to represent newbie authors on her platform. Tamela represents many different genres including parenting, religion, self-help books and coffee-table guides. She is currently accepting submissions and can be contacted on this page. Like Katherine Sands, Jessica Sinsheimer too completed her Bachelor’s degree from Sarah Lawrence College. Right after that, she decided to work as a literary agent at Sara Jane Freymann literary agency, where she has worked ever since. Although she hasn’t worked with very many authors, ‘Emptying the Nest’ and ‘Friends as Family’ are two best-selling titles represented by her. Jessica can be reached on this page. Ann Collette was initially a freelance writer and editor who loved writing about everything under the sun. But in early 2000, she changed her mind and switched paths to join the Rees Literary Agency. Throughout her career in the agency, Ann has represented award-winning authors like B.A Shapiro and Ashley Weaver. It goes without mention that she accepts parenting titles as well. So if you have some of your best works to share, contact Ann on this page. 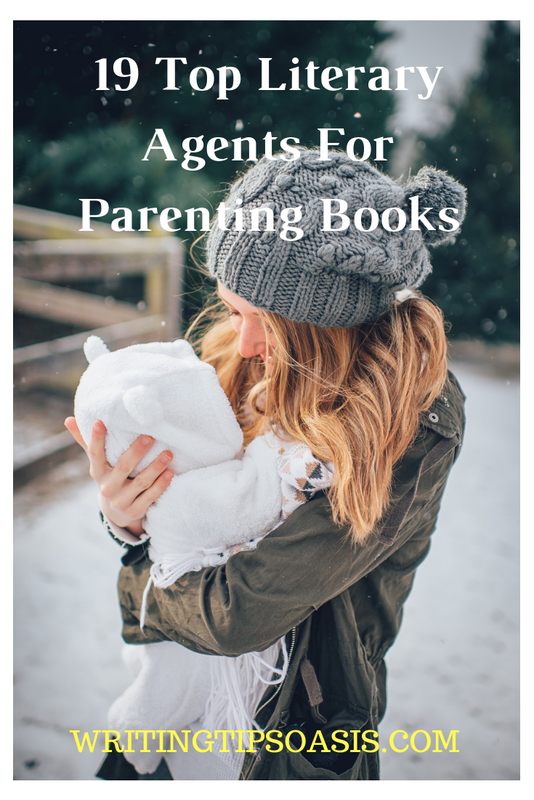 Do you know any other literary agents for parenting books? Please tell us about them in the comments box below! I have a PhD in nursing and 6 grandchildren under the age of 5. I’ve written a book for a young child to help with the adjustment of a new baby. I haven’t seen anything like it on the market. Which agent might be interested in reviewing it?